I am swooning, actually swooning, over this blush & black work dress haha. I love finding dresses that are professional but still have a feminine quality. The fact that there is a matching blush colored blazer makes it the perfect office look. Also, how great are the suede lace up heels? I am so glad that chunky heels are on trend again, because man oh man they are so much more comfortable! 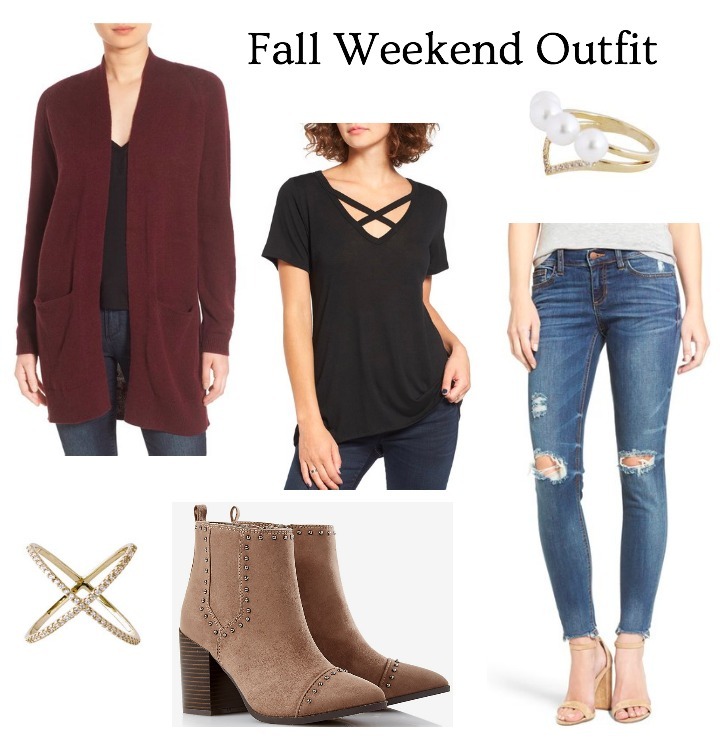 For this week’s weekend look I wanted something comfortable (..what else is new haha). I love the cross strap top and with the burgundy cardigan it is perfect for fall. I’ve been wanting new fall booties as I only have one pair. I love the studded details on these Sole Society ones. And; as always, I want every piece of jewelry Olive & Piper has haha. These rings are perfect statement rings, and such a great deal with the 20% off code! Today is my first full day back in my parents small town and it is weird, and great, and did I mention weird to be back. Fun fact: we still don’t have high speed internet so I am currently heading to my best friend’s hair salon on the main street, where there is actually internet that does not make me want to pull my hair out haha. Wish me luck! Love the color of that pretty blazer! I can't get enough of blush pink. I just ordered this blazer last night! Loving these! Blush is so pretty for work! Thanks girl! And I totally agree!! OOO do you like the fit of it!?! i just caved and ordered it last night. I am so excited about it! I'm loving pink for work. I just styled WHBM's other pink jacket on my blog. I have so many things from that store, but I don't have any dresses. This dress would be a great addition to my pink workwear collection. I'll have to check it out! OO I need to check it out!! Ive never tried one of their dresses either, but I just caved last night and ordered this dress & blazer, so hopefully they're good!